Rugged, high-capacity convertible hand truck. Harper's Steel Tough 700 hand truck and cart's I-Beam nylon truss is 30% lighter than steel, but designed to be as strong as steel or aluminum hand trucks. The lightweight performance provides ease of movement without sacrificing strength. This truck, in either position (horizontal or vertical), is perfect for moving heavy amplifiers, speaker cabinets, and even drum sets. It features 10" puncture-proof rubber tires that will not go flat, and heavy-duty 5” swivel casters to allow for easy maneuverability in tight spaces. Its nylon frame is designed to resist chemicals, corrosion and rust, ensuring long product life. 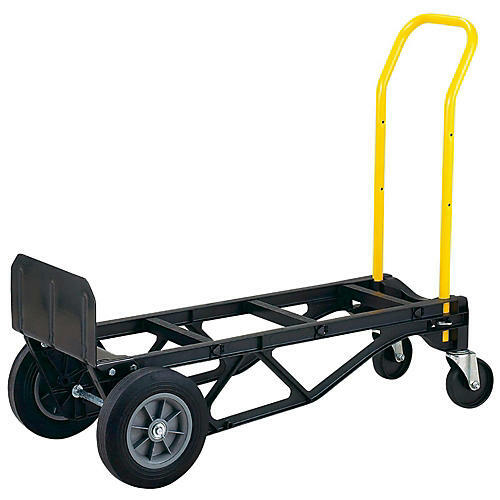 It easily converts from a 2-wheel dolly with 600 lb. vertical capacity into a 4-wheel cart with 700 lb. horizontal capacity. A three-position handle adjusts up to 60" for easy two-wheeling of the tallest loads. Every musician needs a good hand truck. This is a good hand truck. You're a musician.